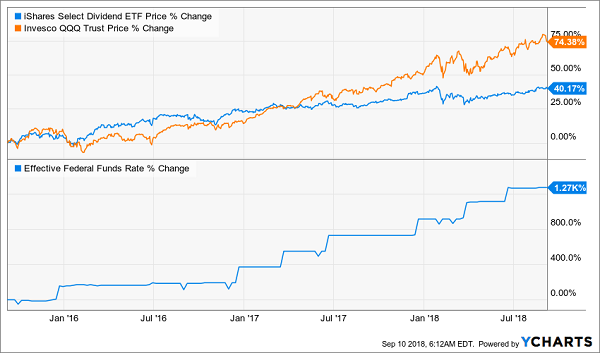 It’s a question I get from investors all the time (including subscribers to my CEF Insider service): how should I invest when interest rates rise? Here’s the common thinking on rates: as they head up, rising yields on US Treasuries will make these investments more attractive than large-cap US dividend stocks. At the same time, corporate borrowing costs will rise, handcuffing American companies’ profit growth. Higher rates will also drive up the dollar, causing foreign stocks to fall. 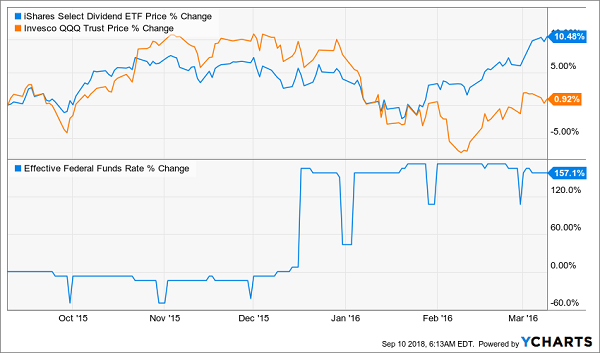 In short, rising rates are bad news for pretty much all stocks. This paragraph has a grain of truth to it, but it’s also misleading. Because higher rates might in theory attract capital from dividend stocks, and they do boost corporate borrowing costs. But just focusing on these two angles ignores why rates are rising in the first place: inflation is getting stronger and economic growth is strengthening. These are both bullish signs for stocks—and they’re much more important to stock fundamentals than interest rates. This happened again in early 2018, and anyone who has been observing the market this year knows what happened as a result. Over the long term, the S&P 500 recovered—and it’s currently up a strong 7.8% year to date, excluding dividends. The lesson? Don’t sell on short-term rate panics: that’s the time to buy. The clearest way to profit from the market’s absurd rate fear is to buy into assets that have been hit hardest in the latest panic. And right now, that means three sectors: utilities, preferred stocks and real estate investment trusts (REITs). These are all asset classes that are sensitive (in the short term) to rates, and they also boast large dividends. As a result, first-level investors have sold these off, setting up bargains. 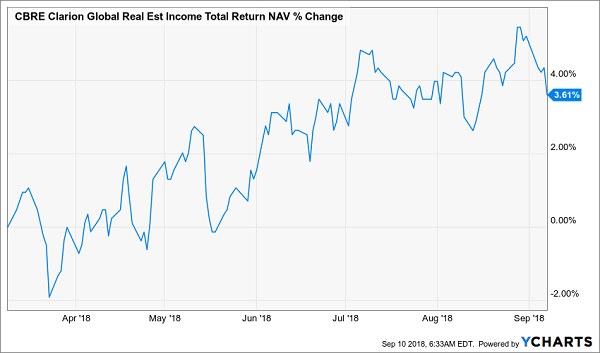 With a 7.2% annualized NAV return, IGR’s dividend looks sustainable in the months ahead, making it an interesting contrarian play on rate fears. Nothing feels better than beating the index while getting an income stream that’s double that of the index (UTG’s 6.6% yield is double the 3.3% XLU pays). My third way to bet on rising rates is the most contrarian: preferred shares. 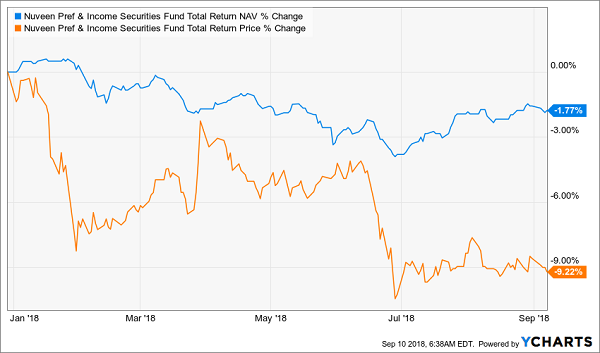 The Nuveen Preferred & Income Securities Fund (JPS) is down 13.7% in 2018. Even if we add in dividends, JPS is still down 9.2%—on the market. JPS’s 9.2% price decline is much larger than its 1.8% NAV decline in 2018, demonstrating the market’s rate-driven (and absurd) panic in selling off preferreds. That has also helped JPS’s dividend yield soar to 7.9%, far ahead of the 6.9% the fund needs to earn from preferreds to make its payout sustainable. 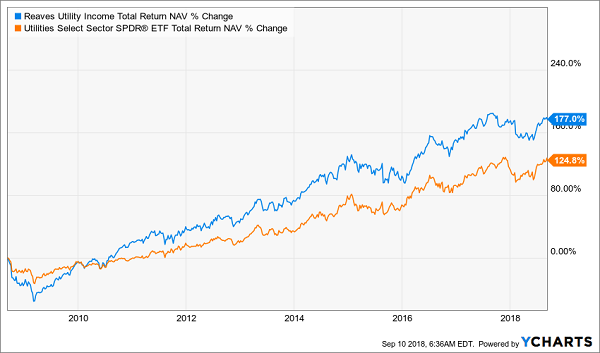 That’s one of the lowest returns this fund has had to earn in a long time, which puts its dividend in the safest position it’s been in quite a while. Yet the fund has been selling off like it’s a dangerous investment, which makes it a very attractive contrarian opportunity. My CEF Insider service holds 16 off-the-radar funds that are my very best picks for any investor’s portfolio—no matter what happens with interest rates. Each of these 16 all stars is poised for fast double-digit gains. PLUS they throw off SAFE yields up to 9.66%! And I know I don’t have to tell you that the yield on the 10-year Treasury will never get near levels like that. That makes these 16 funds safe buys that are set to move even higher as the herd’s first-level rate fears wear off. And all you have to do is CLICK HERE to “kick the tires” on CEF Insider and get immediate access to this standout portfolio with no risk and no obligation whatsoever. Because your no-risk trial also comes with my latest FREE Special Report, which reveals my 5 “Best Buy” funds now. These “unicorns” really are the best of the best—and they boast dividends of 8.5%, on average! Best of all, I’m expecting strong dividend growth here, too, so you’ll easily be yielding 10%+ on this 5-fund “mini-portfolio” in short order. Thanks to their ridiculously cheap discounts, these 5 funds are also on the launch pad for 20%+ price gains in the next 12 months (or sooner)! Your Special Report, the entire CEF Insider portfolio and all the other benefits of membership are waiting for you now. Don’t miss out. CLICK HERE to get instant access to the CEF Insider portfolio, your Special Report and the complete service with no risk whatsoever!